If you’re from the West Coast, and don’t happen to be a food blogger, then you probably haven’t heard of a Whoopie Pie. I could be wrong, but I’ve never seen one here, and when I mentioned that I’d made a batch of my own recently, more than one person asked, “What’s a Whoopie Pie?” Although at times it feels as if I’ve lived just about everywhere, and did spend some time living on the East Coast when I was a child, I hadn’t heard of them, either. I figured they were Moon Pies even if the only connection I could make was that each was called a pie — a pie that neither resembles. I know what Moon Pies are and it didn’t take me very long to decide they’re nothing like Whoopie Pies. 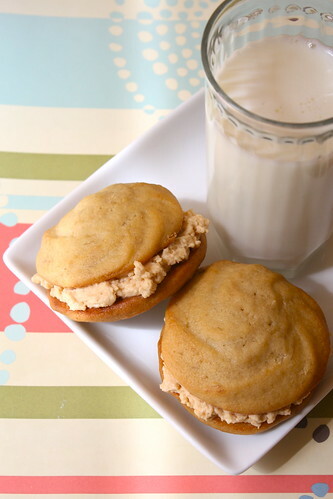 Sure they can both be considered sandwich type cookies, but I can’t say that very loudly around Whoopie Pie purists who claim they’re absolutely not cookies, either. 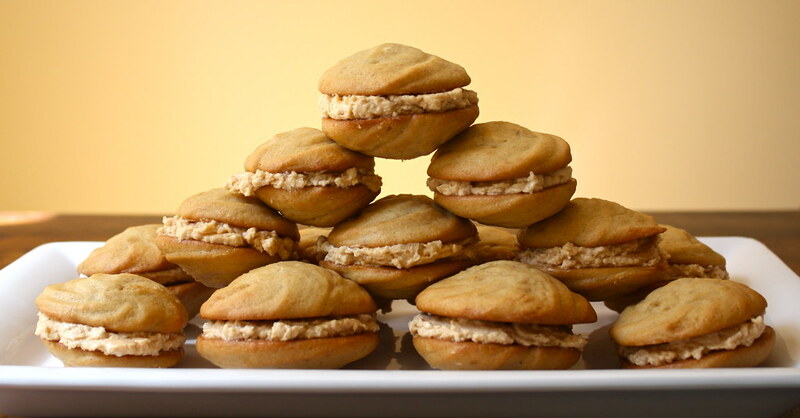 Like Moon Pies, Whoopie Pies have three parts: a top, a bottom, and cream in the middle. I have to add that the outside is traditionally chocolate, and the filling, white and creamy. But a Moon Pie has a chocolate coating and a Whoopie doesn’t. I haven’t tasted a real Whoopie Pie, so I’ll get in trouble for mentioning the “cream” is anything but if you consider that cream comes from a cow. 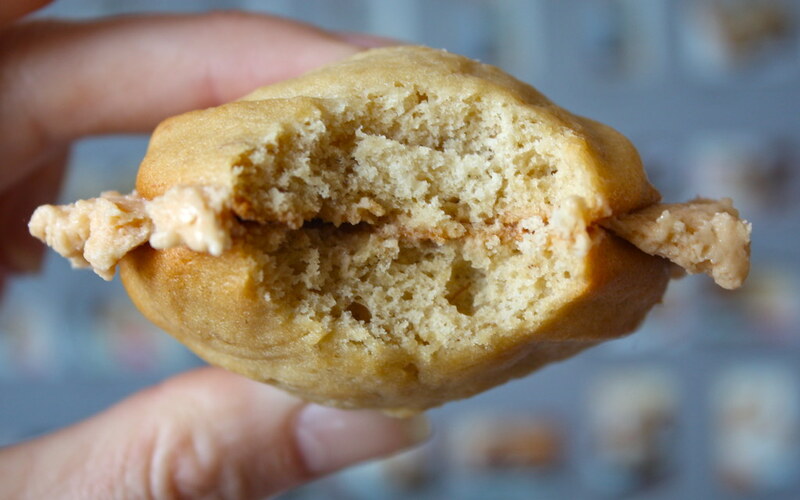 Actually Whoopie Pie “cream” is more of a marshmallow based filling made with shortening and more fluffy than what you might find in a Moon Pie. The exterior is more cake like and fluffy. Your teeth sink right into its sweet softness, and you just may end up with a bit of filling on your face as you take that first bite, because it has a tendency to squish out the sides a bit as you savor it. But wait. I said I hadn’t tried a Whoopie Pie before. So yes, I tried my own. And true to form, I sort of changed things a bit. I couldn’t help myself. Besides, I had a ripe banana just waiting to be baked into something, so that’s where I began. 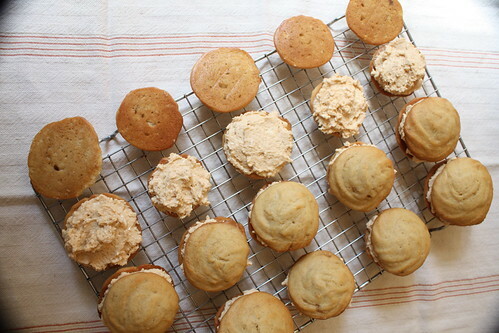 Banana Whoopie Pies? Sure, why not? And then I saw this Salted Caramel Buttercream and knew the two together would be irresistable. I will subtley not mention just how many I’ve sampled. Preheat oven to 350 degrees F and position two racks in the center of the oven and line two baking pans with parchment or silicone. 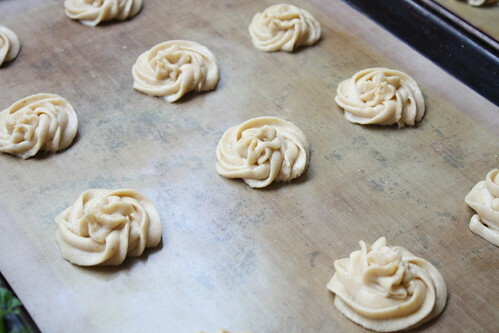 In one bowl, add the flour, baking soda, baking powder, and salt, and whisk to combine well. In another bowl, mix the creme fraiche with the mashed banana until smooth. With an electric mixer, cream the butter and sugars until fluffy. Mix in the egg and vanilla and beat until smooth. With the mixer running, alternate adding flour mixture, and then banana mixture beginning and ending with the flour. Mix a bit after each addition until well blended. Spoon or pipe rounds about 1-1/2 to 2″ in diameter. Bake about 10 minutes. Cool about 5 minutes on the baking pans before removing to cool completely on racks. Cover with plastic wrap if not filling. Makes about 30 whoopie rounds for 15 pies. Thoroughly clean the bowl of the mixer. 1/2 c. butter, unsalted, room temp. In a small sauce pan over medium high heat, cook the water and 1/4 c. of the sugar until it turns a deep amber color. Do not stir the solution at all during this process. Remove the pan from the heat once the color is achieved and carefully add the heavy cream (it will quickly bubble up…). Stir it until it is creamy, then scrape into a small bowl to cool. In a double boiler over simmering water, heat the egg whites, the remaining 1/4 c. sugar, and salt, stirring constantly until the mixture reaches 140 degrees F. Immediately pour into the clean bowl of your mixer and beat on high until stiff peaks form and the mixture is completely cool. Feel the bowl to determine this. With the mixer running, add the butter 1 T at a time, mixing well between additions. If the mixture begins to break or curdle, stop adding the butter and beat until it comes together again before resuming with the remaining butter. 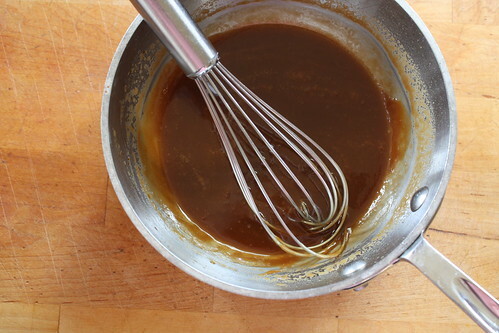 Add the vanilla, and drizzle in the cool caramel, mixing as you go. Finally, add the marshmallow creme 1 T at a time, mixing after each addition. Use a small offset spatula or fill a piping bag to mound filling on one flat side of a whoopie round. With a second round press down to sandwich, and twist lightly. Will keep at room temp (65 degrees F) well wrapped in plastic. I’m completely sold. It’s the cake-like exterior that did it. Oh my goodness. These are fabulous. Many thanks to Joe of Culinary in the Desert for this delicious recipe! 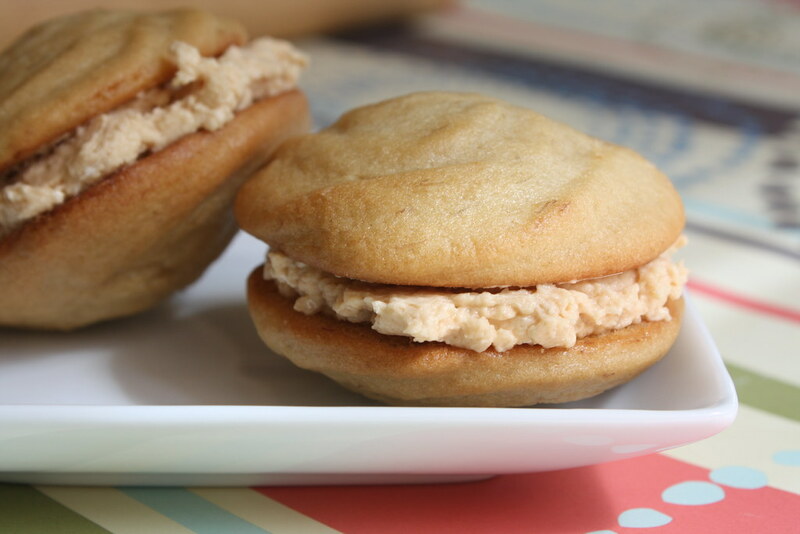 Joe includes a cream cheese based filling recipe to go with his Whoopie Pies, so check the link in the introduction of this post for that. And many thanks to Jennifer of Foodess for her recipe as well. I’d made a caramel butter cream before, but do have fun looking for new ideas and definitely found a good one in her base recipe. She features a chocolate Whoopie with this filling and it sounds amazing. I used very chunky French sea salt in this recipe. You know — the kind that’s still moist and looks as if someone scraped it right from the ocean? It was perfect. I love my caramel salty! Although I’m not a big fan of marshmallow anything, I felt I needed to do something to make my whoopie pies at least semi-authentic. So I added the marshmallow creme. I wanted the filling to be as stable and sturdy as possible, and the marshmallow creme worked very nicely with the buttercream. Because I didn’t think this out too well ahead of time, I realized after the fact that I just may not have enough filling for the number of whoopie rounds I made. So the marshmallow creme actually helped stretch the filling farther. 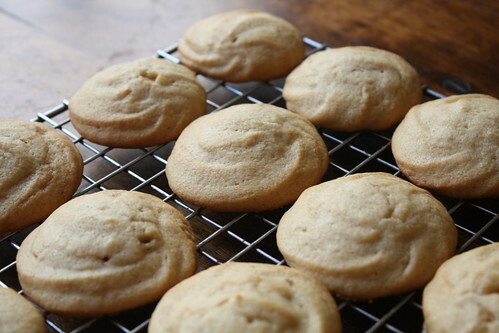 Otherwise, if you’d prefer not to add the marshmallow, I’d say double the buttercream recipe so you have a nice amount of filling in each whoopie. It sounds like 4 T of marshmallow creme shouldn’t make that much of a difference quantity wise, but it was the perfect amount for th quantity I had. Overall, these things are addictive. I bake all the time and have no trouble sampling or rationing what I make. These have been quite the struggle to avoid while they’ve been in my kitchen. In fact, the whole idea of a Whoopie Pie has me truly thinking about the possibilities. Thinking would be the key word there, because there’s no way I could keep these in the house. Ever.